From Annie M. Bankhead Dr., bear right into the entry ramp to Downtown (I-30)/Hot Springs/Texarkana. Merge into I-440 West. Take the I-30 East exit to Downtown, exit 138A. Exit onto I-630 West, exit 139B. Take the North University Avenue exit, #5A. Turn right on University Avenue. Go 1.2 miles. Our office is in the Prospect Building on the right side of University at the top of a hill. Take I-40 West and exit onto I-30 West, exit 153B. 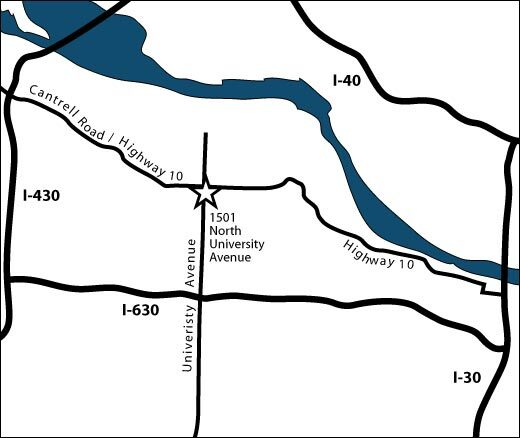 From here you will exit onto I-630 West, exit 139B. Take the North University Avenue exit, #5A. Turn right on University Avenue. Go 1.2 miles. Our office is in the Prospect Building on the right side of University at the top of a hill. Take I-40 East and exit onto I-430 South to Texarkana, exit 147. Take I-630 East, exit 6, and continue to University Avenue. Exit on University and turn left. Go 1.5 miles. Our office is in the Prospect Building on the right side of University at the top of a hill. Take I-30 East and exit onto I-430 North, exit 129. Take the I-630 East ramp to get onto I-630. Exit at University Avenue, exit 5, and turn left. Go 1.5 miles. Our office is in the Prospect Building on the right side of University at the top of a hill. Take I-530 North and continue on I-30 East. Exit onto I-630 West, exit 139B. Take the North University Avenue exit, #5A. Turn right on University Avenue. Go 1.2 miles. Our office is in the Prospect Building on the right side of University at the top of a hill.